Every family needs a dentist they can depend upon. If you’re looking	for a dentist in St. Louis you can put your trust in, you can find the	services you need at West County Dental. 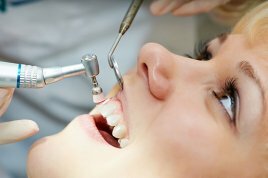 Our friendly dentists provide	a comprehensive range of dental services for the entire family, including	routine cleaning and preventative services. The key to staying on top of your oral health is making regular appointments	at your dentist’s office. At West County Dental, we provide preventative	services to help our patients maintain good oral hygiene, prevent dental	diseases, and keep their gums healthy. We recommend that each member of	your family make a visit to our office for a routine cleaning and checkup	every six months. We offer a variety of sedation options to help ensure	that your visit is as comfortable as possible. When you visit us for the first time, we will begin by doing a set of X-rays	of your mouth to check your current oral health. We will also review your	medical history for anything that may have an impact on your dental health. Then, we will do a thorough examination of your teeth and gums, including	checking for tooth decay and signs of gum disease. We will also check	your biting, chewing, and swallowing patterns to make sure that they are normal. Next, we will do a professional dental cleaning, removing tartar and plaque	buildup from your teeth. We will polish your teeth when necessary to keep	the surfaces smooth. We also offer fluoride rinses to reduce the risk of tooth decay between	professional cleanings. For children, we can also provide sealants to	help protect developing teeth from cavities. If you require any further treatment before your next cleaning, you can	make an appointment at our office before leaving. We also offer same-day	crowns and dental implants for those who would like to complete their	treatment in a single visit. If it’s been too long since your last visit to the dentist, don’t	hesitate to contact West County Dental. We have been serving the community	for more than a decade, and we take pride in providing our patients with	a comfortable environment, the latest dental technology, and state-of-the-art	treatments. Whether you are in need of a routine cleaning, a filling,	or oral surgery, contact us today to schedule an appointment at our office	in St. Louis.